tickets for Atlanta, Raleigh, Nashville, Houston, San Francisco, Seattle, Minneapolis, Detroit and Pittsburgh beginning Monday, Feb. 15 (at 12:00 p.m. through Saturday, Feb. 20 at 5:00 p.m. local. 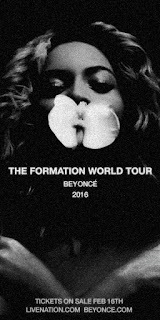 American Express Card Members can purchase tickets for Beyoncé’s The Formation World Tour 2016 in the United Kingdom, Ireland, *France, Italy, the Netherlands, Sweden, before the general public from 12:00 p.m. Tuesday, 9 Feb. to 5:00 p.m. Saturday, 13 Feb (France pre-sale ends Friday, 12-Feb @ 5pm). American Express Card Members can purchase tickets for Germany before the general public from 12:00 p.m. Monday, 15 Feb. to 5pm p.m. Friday, 19 Feb. local time.